Description: Originally published in 1997 as Arabana-Ikibiti by the designer's own publisher Bambus Spieleverlag, and reprinted by Funagain in the US, this later edition is from Kosmos and Rio Grande. A simple 2 player game, players use cards to place or remove bridges from a collection of islands. If you get the majority of bridges around an island, you put one of your marker stones on it and also throw off any of your opponents bridges. That may mean they no longer have a majority of bridges on the adjacent island and so lose a marker stone. This edition has excellent graphics and nice wooden pieces and plays very well. 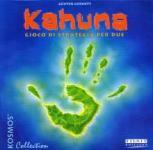 Kahuna is part of the Kosmos two-player series.